A new employee engagement application that appears to address the key levers of engagement as defined by the Enterprise Engagement Alliance and ISO 10018 standards has been introduced by Coggno, a leading supplier of online learning for businesses and professionals. It provides both standard compliance training as well as customized content for clients. Why is the launch of this product from a relatively unknown company significant? Because it comes from a training company with thousands of customers, not a rewards and recognition firm; has a very low price tag; can be downloaded from the web and deployed in a short time, according to the company, making it ideal for small businesses. 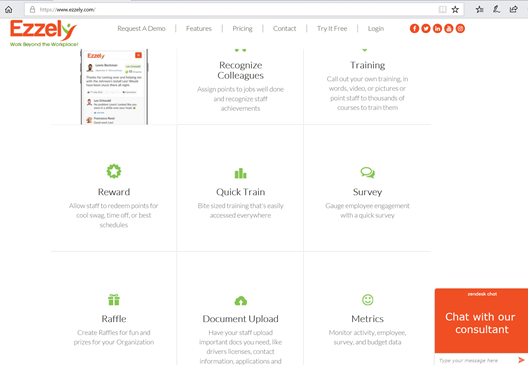 From the web site, Ezzely addresses all the key features of an engagement portal, including the ability to manage surveys, content, activities, recognition, rewards, training, games, and extensive metrics. Technologies like this will help Enterprise Engagement go mainstream into the thousands of smaller companies Coggno services along with large ones.